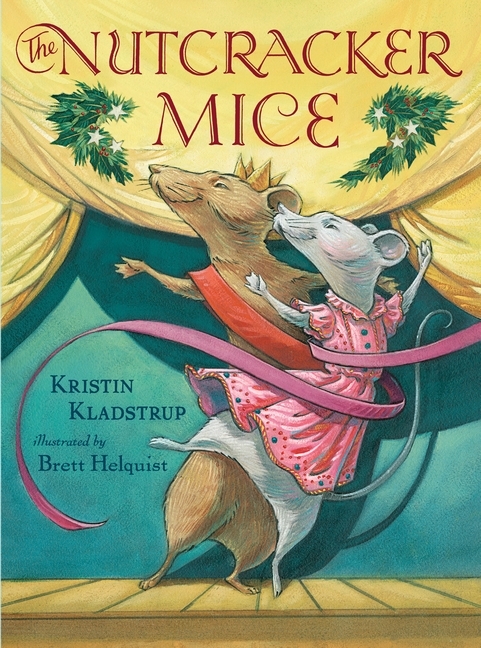 The Nutcracker Mice by Kristin Kladstrup with illustrations by Brett Helquist is a holiday gift, wrapped in a marvelously rich tapestry of mice, ballet, tradition and change and life in St. Petersburg, Russia, 1892. Kladstrup's story is a deeply engaging, page-turner, made even more vivid by Helquist's detailed illustrations. Esmerelda is a young mouse cast as Clara in the Russian Mouse Ballet Company's debut production of The Nutcracker, which will coincide with the ballet's (human) debut at the famous Mariinsky Theater. In fact, the Russian Mouse Ballet Company exists hidden in the walls of the Mariinsky, benefitting from the human musicians. But, there are many challenges facing the Russian Mouse Ballet. An illness that swept through the colony of mice living in the theater a few years back has diminished their troupe. There are mousetraps all over the theater and food for the mice is scares. And, possibly worst of all, of late the mice have been preferring to watch the (free) performances of the human ballet over those of the Russian Mouse Ballet, which require morsels of food in return for viewing the performance. 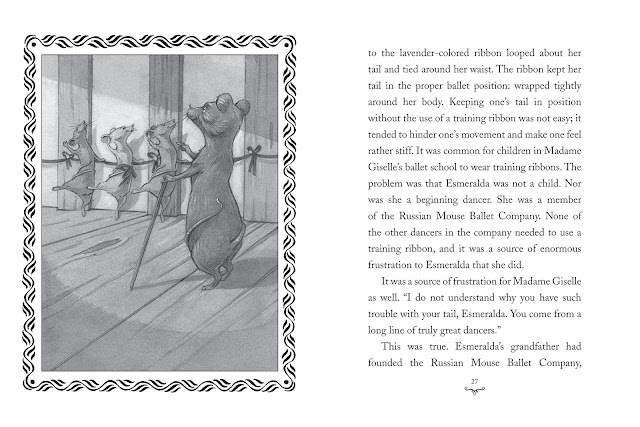 This knowledge weighs on Esmerelda who, through a chance meeting, is befriended by a mouse named Maksim who takes her to the Balalaika Café where she sees a different kind of dancing and learns that the mice of St. Petersburg have no interest in seeing a new ballet where mice are villains and there is no romance. Intertwined with the fate of Esmerelda and the Russian Mouse Ballet is that of Irina and her father and mother, the chief custodian and a seamstress at the Mariinsky. Nine-year-old Irina is a budding costume designer herself, sewing marvelous gowns for Lyudmila, her small (mouse-sized) wooden doll. But, her father's repeated failures to rid the theater of mice, including a moment when one runs across the foot of the visiting Monsieur Tchaikovsky, cost him his job and put the mice in further danger. In a magical, midnight moment, Irina and Esmerelda connect and they end up helping each other to happy ends. Esmerelda convinces the Russian Mouse Ballet to rewrite The Nutcracker, changing it to Clara and the Mouse King (a synopsis of each ballet is included in The Nutcracker Mice) and, even more dramatically, convinces them to use costumes and stage settings, something that they (and the human ballet) had rejected in the past. The Nutcracker Mice is an engaging book, regardless of how you feel about the ballet or mice. Kladstrup brings excitement and drama to the page with her colony of mice as well as with the humans. 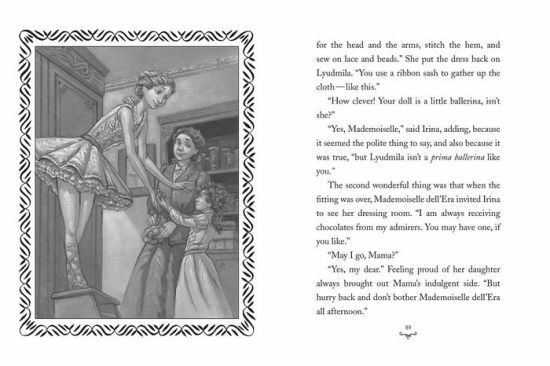 Esmerelda is clever and courageous, as is Irina, and it is thrilling to see their stories unfold and cross paths, brought to life by Helquist's marvelously detailed illustrations.